﻿ When Does Implantation Occur? Q: When does implantation occur? A: For most women, implantation occurs 6-12 days after ovulation, though some have reported possible implantation as early as 3 days after ovulation. 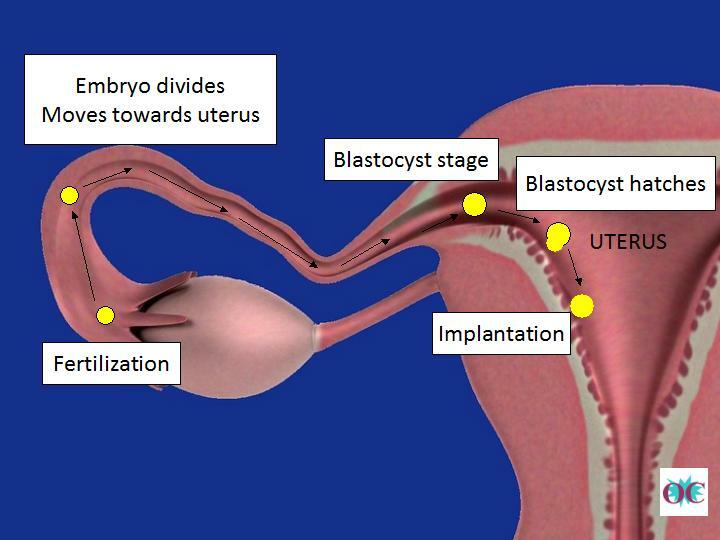 Implantation refers to the step in which the embryo attaches to the uterus. This is an important milestone, as an implanted embryo will start to produce a hormone called hCG (Human Chorionic Gonadotropin), and the presence of hCG is the basis of most pregnancy tests. In addition, sometimes implantation causes bleeding, and implantation bleeding, when present, is one of the first signs of pregnancy. The egg is fertilized by a sperm in the Fallopian tube. The fertilized egg (embryo) starts to divide and starts to move towards the uterus. The embryo reaches the uterus. When the cells in the embryo have divided enough times and are now differentiated into two types, the embryo has reached the blastocyst stage. The blastocyst hatches out of its zona pellucida, a layer that originally offers protection to the egg. When the blastocyst reaches the uterus and hatches out of its zona pellucida, implantation can take place (an ectopic pregnancy is when implantation takes place outside of the uterus). In in vitro imaging studies, scientists have been able to study the growth of the fertilized egg to the blastocyst stage,1 and in such studies, it takes five days from fertilization for an embryo to get to that stage. Based on this data, it takes at least 5-6 days for implantation to occur after ovulation. However, all studies to date are done outside of a human body. Since every human's body is different, it is possible for the embryo to reach the blastocyst and the zona pellucide hatching stages earlier than conditions in vitro. The most widely quoted time to implantation came from a study by Wilcox et al (1999).2 In their research study, the scientists studied 126 conceptions that resulted in live birth and found that implantation occurred between 6 to 12 days after ovulation, with the mean of 9.1 days. Even though the earliest date of implantation occurred 6 days after ovulation in this study, it is worth noting that the sample size is fairly small, and should not be taken to represent the absolute range of implantation time. Since every woman's body is different, it is possible that a fertilized egg can develop and move at different rates, and as such it is possible (though likely rare) that implantation can occur before 6 days or more than 12 days. There have been anecdotal accounts that implantation can happen as early as 3 days after ovulation. While there is no scientific evidence that implantation date can fall outside of the 6-12 day range, there has also been no scientific evidence that implantation date cannot possibly be outside of this range, either. So, while most implantations will occur between 6 and 12 days after ovulation, it is possible (though rare) for implantation to occur as early as 3 days after ovulation. C. C. Wong, K. E. Loewke, N. L. Bossert, B. Behr, C. J. De Jonge, T. M. Baer, R. A. Reijo Pera, Non-invasive imaging of human embryos before embryonic genome activation predicts development to the blastocyst stage, Nature Biotechnology, 28:10 1115-24 (2010). A. J. Wilcox, D. D. Baird, C. R. Weinberg, Time of implantation of the conceptus and loss of pregnancy, N. Engl. J. Med, 340, 1796-9 (1999).